IGM: What has been the improvement in GPS SV clocks over subsequent generations in terms of time and frequency stability and accuracy, as well as longevity? VANNICOLA: The GPS AFSs have undergone substantial improvements over subsequent generations. The Block II/IIA RAFS, built by the Rockwell Anaheim Division, was the final production model of numerous modifications to the Block I RAFS. 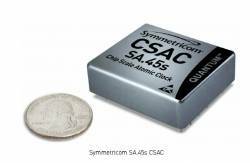 The Symmetricom (then Frequency and Time Systems) cesium clock flew on all Block II and IIA satellites. In addition, alternate source cesium clocks from Kernco and Frequency Electronics Inc. were developed and flown in Block IIA. The Block IIA AFSs continue to perform within specification and operate past their expected lifetime. The Block IIR/M RAFS was a new design from Excelitas (then EG&G) and has displayed excellent reliability and longevity. The Block IIF RAFS has displayed better performance than the Block IIR/M due to an improved physics package. The improved performance of the Block IIF CAFS compared to the Block II/IIA CAFS is due to design concepts previously demonstrated in commercial digital cesium clocks to reduce environmental sensitivities. Improvement to the cesium beam tube technology from Block II/IIA to Block IIF also resulted in improved short-term stability and lifetime. Block IIR/M and Block IIF AFS have performed better by an order of magnitude than the Block II/IIA AFS. Currently the Block IIF RAFS displays the best performance in the GPS constellation. IGM: How does GPS system timing performance compare with other GNSS systems? How do the various GNSS systems compare with one another in terms of the quality of their SV clocks? VANNICOLA: NRL does not monitor GNSS system time performance; however, we can provide the following details about on-orbit performance of the GNSS system clocks. For current on-orbit GPS CAFS and RAFS, one-day stabilities range from 5pp10-15 to 1pp10-13; the GPS AFSs of the same type and block tend to perform similar to one another and within their specifications. The current GLONASS constellation consists of 24 operational satellites that include GLONASS-M and GLONASS-K satellites. The GLONASS-M satellites launch with three CAFS and are expected to achieve a one-day stability of 1pp10-13. The GLONASS-K satellites contain CAFS with a quoted clock stability of 1pp10-14. The available one-day stabilities show the GLONASS AFSs range between 2pp10-14 and 2pp10-13. The Galileo constellation will consist of 30 satellites. Each satellite is planned to launch with two Passive Hydrogen Masers (PHMs) and two RAFS. Four In-Orbit Validation (IOV) satellites have been launched thus far. Previously, two Galileo In-Orbit Validation Element (GIOVE) satellites — since decommissioned — were launched for evaluation. GIOVE-A contained two RAFS and GIOVE-B contained one PHM and two RAFS. The performance of the Galileo GIOVE-B PHM achieved on-orbit a one-day stability of 1pp10-14 and the Galileo GIOVE-A and GIOVE-B RAFS stability ranged between 1 and 2pp10-13. IGM: What would the elimination of the leap second from UTC mean for GNSS system operators? For GNSS users? VANNICOLA: The elimination of the leap second from UTC has been debated for years. The International Telecommunication Union–Radionavigation (ITU-R )Working Party 7A has reviewed an extensive number of technical considerations and studies, and no consensus has been reached. We can’t speak for GNSS system operators, but one could speculate some type of modification would be required for standard operating procedures should the leap second be eliminated. GNSS system operators would need to examine possible limitations to the various GNSS systems when the tolerance limit between Coordinated Universal Time (UTC) and UT1 exceeds 0.9 second. At present, when a leap second is introduced — with preferred months and days of the month for implementation, six months’ notice is provided prior to implementation. Leap seconds also do not occur on a regular basis, e.g., yearly or every 18 months, which proves to be difficult for planning purposes. Leap second elimination would most likely change little that would affect GNSS users, but it might require some planning. User equipment dependencies may exist that determine how well the manufacturer has built in the ability to accommodate or not accommodate the leap second. IGM: What are the plans for developing future capability in GPS time? VANNICOLA: NRL is not aware of specific plans for future GPS space-qualified clocks; however, the National Institute of Standards and Technology is undertaking GPS-related work that could lead to a cold atom space clock. The NASA Jet Propulsion Lab and Symmetricom have investigated a Mercury Atomic Frequency Standard (MAFS), which is a mercury ion storage clock for future GPS use. Currently, no plans have been made to actually fly these devices. No space-qualified masers are being planned for GPS, although one comparable to the Galileo maser was developed for GPS in the 1980s.